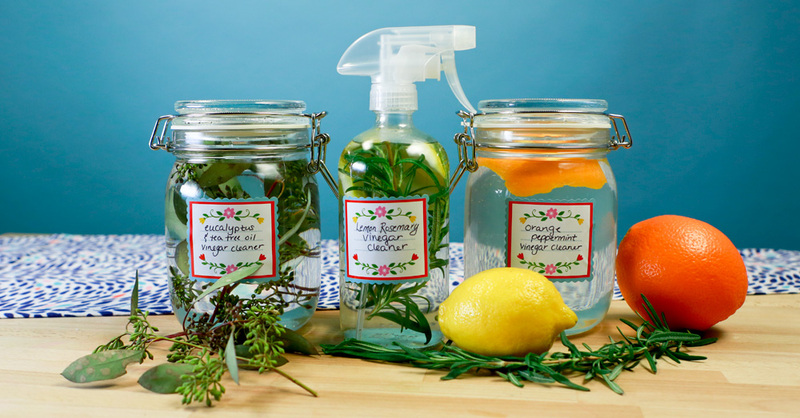 This natural cleaner has tons of uses, but doesn’t have to smell so … vinegar-y. White vinegar is something of a super tool when it comes to cleaning. It’s non-toxic, inexpensive, easy to find, and cleans, oh, just about everything: It brightens windows, freshens laundry, banishes spots on carpeting, and much more. A spray-bottle of a vinegar solution is great to have around for pesky cleaning tasks (though, avoid using it on marble countertops and hardwood floors, since the acidity could damage them). The most effective cleaning mixture is 50% white vinegar, 50% water, but you can also add fruit peels, herbs or essential oil to the bottle so your house will smell great, too. Just give it a shake and let it infuse for at least a week. 1. A Balanced Blend: Two or three pieces of lemon rind and a few springs of rosemary blend together to create a clean, fresh scent. Plus, the fruit’s acid adds extra cleaning properties — perfect for stubborn stains. 2. A Hint of Citrus: A little bit of essential oil goes a long way, and 2-3 drops of peppermint are just enough to lend an energizing burst to the summery scent of orange rinds. 3. A Cool Burst: A few sprigs of eucalyptus and 2-3 drops of tea tree oil create a stench-absorbing powerhouse — and some people believe tea tree fights bacteria, too. Whether that’s true or not, this combination is incredibly invigorating. 4. An Earthy Option: Or, infuse your solution with sage, like Krys at Melodrama. 5. Spicy and Sweet: This recipe adds interest with cinnamon sticks and vanilla beans. 6. 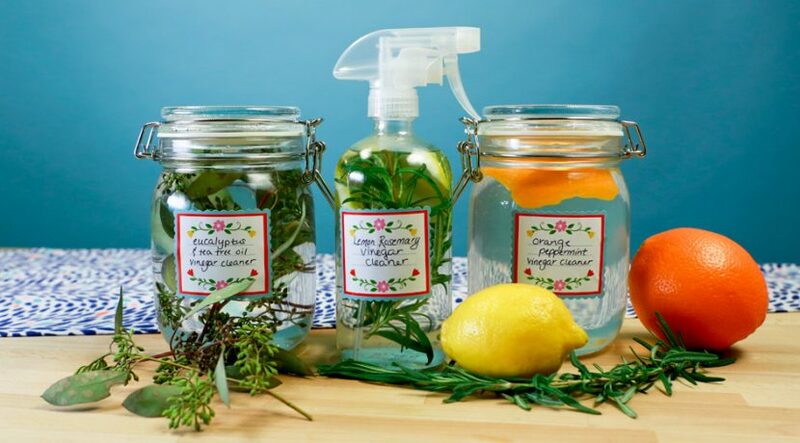 A Relaxing Aroma: This blogger infused her vinegar solution with lavender. 7. Play with Oils: Essential oils come in many fun scents (and some may kill bacteria and mold). Kate at The Hip Girls’ Guide to Homemaking added peppermint oil to her vinegar solution. Just be sure to shake to combine before using.